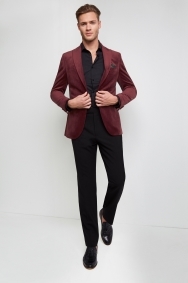 Get personality into your formalwear. 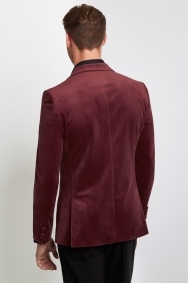 With its rich red colour and velvet material, this jacket will give you an on-trend edge when you’re dressed for smart nights out. 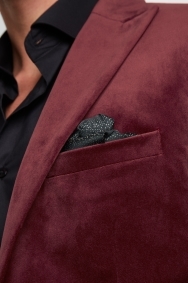 Any party that asks for formalwear will see you reaching for this bold jacket as it’s cut to meet the dress code with a single-button fastening and peak lapels. The skinny fit gives you a streamlined frame. Make it stand out by keeping everything else in your outfit plain black. If you want to add more personality, choose a navy paisley pocket square. Love the jacket. Unfortunately seem at the back wasn’t re sown when it was tailored and then within the hour the button has come off the jacket. 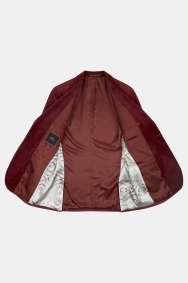 Will be returning it to the Oxford Circus store as soon as I can.